A lot of bands do whatever they can to try and avoid what in the industry is called ‘the sophomore slump,’ as it pertains to bands releasing a second album. It’s hard to think that you could even mention that phrase in the same sentence as Boys Like Girls, seeing as how wildly popular the band’s debut eponymous release was, but there are moments of their second album ‘Love Drunk’ that could lead you to believe they could endure the dreaded afore mentioned slump. 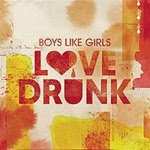 ‘Love Drunk’ is about as catchy as you can get, which shouldn’t be a surprise at all when talking about Boys Like Girls. There are some tracks that are way too catchy that they come off as something you’d see a boy band dancing and singing along to. ‘Heart Heart Heartbreak’ sounds way too close for comfort to an N’Sync track. There is a lot to like on ‘Love Drunk,’ that much is for sure. The band still has the ability to channel early the Startling Line (‘Love Drunk,’ ‘Two Is Better than One’), while still maintaining the songwriting that made them the band they are now (‘Chemicals Collide,’ ‘She’s Got a Boyfriend Now’). So don’t worry scenesters, Boys Like Girls have not changed. If at all possible, they have stayed the same, but with a few tweaks here and there.